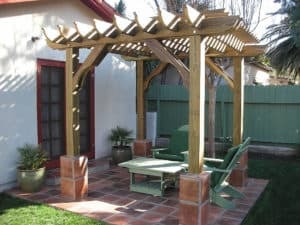 Do-it-yourself or DIY pergola kits can be a very fun and rewarding way to complete your backyard home improvement project. In addition to the rewards of the accomplishment, you can also reap the benefits of a fresh air project and new outdoor hangout! Did you know that fresh air makes us happier, relieves tension, and sharpens our minds? Outdoor projects we complete ourselves can boost our health and also bring happiness that we can share with friends, neighbors, and family. Let us help you make it easier to get much-needed fresh air, whatever part of the country you’re in and get started making new memories with those you love in the great outdoors. After that last top slat is attached, you’ll be able to sit back and relax under the pergola you assembled yourself*. Now that’s satisfaction! 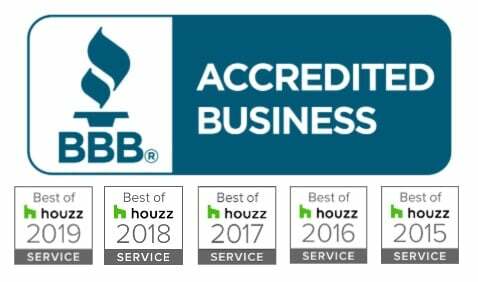 (*By the way, you could also hire a contractor to help put it together, and you’ll still get plenty of enjoyment from sitting underneath your beautiful wood pergola). DIY spaces come in different forms. Maybe the do-it-yourself part of the project is that you designed the space. Maybe you designed it AND you built it. Either way, DIYers like you know that there are lots of ways to make your vision a reality. 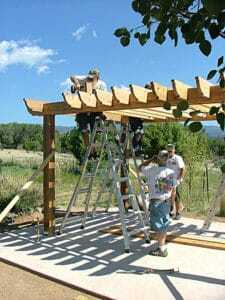 And the same thing holds true with pergola kits. 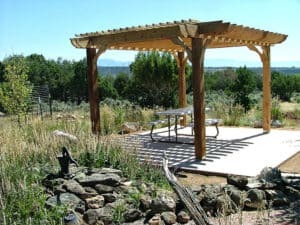 You may have done some research to learn about the many options available for DIY pergola kits. 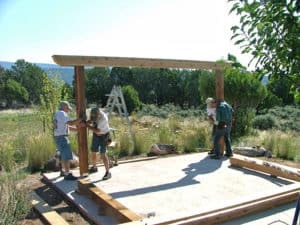 There are a few simple decisions you’ll make when you’re choosing the DIY pergola kit for your project. Style, size, and material. Do you want a patio cover that provides a lot of shade, medium coverage, or a more open design? Our standard pergola kits are made in varying levels of coverage, and can also be customized if the standard sizes and features aren’t a match for your project. Compare coverage options for your pergola to choose the pergola that’ll work for your space. How large is the space you’d like to cover? Our standard pergola kits are made in sizes ranging from 8×8 to 20×20. Review the sizes along with dimensions needed for your space planning: Overall tip to tip; outside post to post; and inside post to post. Plan out your space for each of these measurements to determine the size you’ll need. Use our guide on how to measure a pergola for help. Since pergola kits can be built with varying amounts of coverage and in many different sizes from small 8×8 pergolas all the way up to 20×20 pergolas, the size you choose depends on what you’re planning to create. For our DIY pergola kits, the most popular pergola sizes are sizes that would fit a common backyard or commercial setting, such as 8×8, 12×14, 12×16, 14×14, 15×15, or 20×20. You may find that your backyard project is a perfect match with one of those sizes too! Pergolas can be built using a variety of material. Two leading lumber materials for pergola components are western red rough sawn tight knot cedar and pressure treated #1 southern yellow pine. We’ve been building quality wood pergola kits since 2008 with these top wood types. These types offer high quality wood that results in a sturdy, beautiful structure you’ll admire out in your backyard for years to come. Compare the pergola wood types for your DIY project. Consider all the aspects of your project when planning how to incorporate a pergola in to your DIY project. The DIY pergola kit you choose depends on what you envision creating. Many DIY projects incorporate a gazebo, trellis, or pergola. It’s not surprising, since there are so many uses for a patio cover like a pergola! 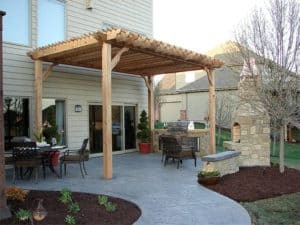 If you like one of these project ideas with pergolas, contact us if you need help finding the right size and style to make it happen in your outdoor space. This simple sitting area has been beautified by adding an 8×8 pine Big Kahuna pergola kit to the existing patio. This homeowner used their additional tiles to build decorative bases around the pergola posts. 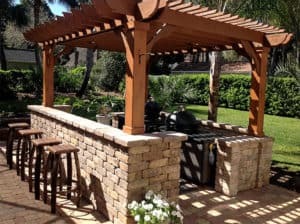 A DIY pergola can be the border for your new outdoor bar and kitchen and a welcome cover from the sun. Pergolas frame in any size space you envision for your backyard entertainment space. Completely transform your backyard space into your favorite place to hangout. Build landscaping that incorporates a beautiful pine pergola, stone fireplace, and sitting wall. You can spend hours huddled around the fire on a cool evening. Why not get started today and finally finish your backyard patio. Order one of our DIY pergola kits to create the outdoor escape that you can enjoy for years to come!